I’m one of the first few in the queue for it at my local library. i picked up a copy as well, and am slowly (on purpose) working my way through it. so far, it has been an enjoyable read and i especially enjoy all the cultural stories that have nothing to do with bikes. the book is not really about biking, however i think many cyclists will feel a kinship with david because of his perspective on the world. I love the old school binding and the cloth like cover. The content is enjoyable as well. This is my one of the favourite movie. the title may be an ironic echo of Che Guevara’s The Motorcycle Diaries; who knows? – is a deceptively straightforward book, an impressionistic glimpse of some of the cities that Byrne has explored on his pushbike. 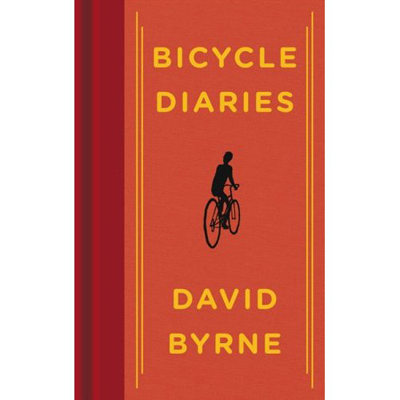 As anyone familiar with David Byrne’s oeuvre might expect, it is not really a book about cycling per se, more a book in which cycling is, if you’ll pardon the pun, the cog for Byrne’s thoughts about architecture, music, art, travel, politics, religion, kitsch, decay and – a recurring theme – our “quality of life”. David Byrne? THE David Byrne? I think a trip to Borders is in the offing tonight after work. Yes, THE David Byrne. Support your local library!!! I haven’t read it yet though, was actually waiting for the review.Probably i will now go for it.